Like my Sushi project, I wanted to do another in my series of food renders. The subreddit r/blender has a monthly contest and while I was modeling this project, the current contest subject was photorealism. 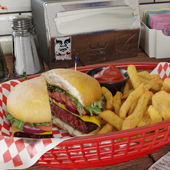 I figure the contest fit my food theme, and decided to go hard on this render. 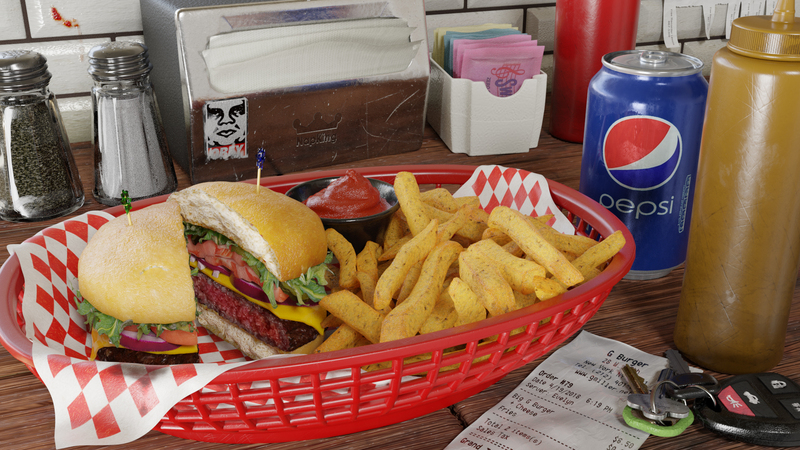 Not only did I want to practice my subsurface scattering, I also wanted to model in some props that you might expect at a burger joint. For those unaware, “subsurface scattering” is the real world physical phenomenon where light doesn’t just bounce off a surface. Some materials, typically organic, also let some of the light enter their body and bounce (scatter) around inside their volume. To make sure food doesn’t look too “plastic” (and to help cross the uncanny valley), most food should have some SSS (Subsurface scattering) dialed in. I’m by no means an expert in SSS, and in fact, I find it quite difficult to get right. But that’s why I’m practicing with food scenes: to hone my ability to dial in SSS and cross the uncanny valley with food renders. The SSS was critical on the bun, which I’m happy with, but I’m still unhappy with the fries. It was difficult finding a balance between “too doughy” and “fried crispy surface” for the fries, but obvi I’m happy enough with it to release the render. Using custom maps for the OBEY sticker on the napkin dispenser was fun – I as able to make it look like it had attempted to be peeled, given up on, and had been worn out after being around for a while. The scratch maps on the dispenser were fun as well. The fresh ketchup stain on the tiles went off without a hitch, making me proud of my shader skills. The tiles themselves were both 3D modeled because they have more depth than I could recreate with a normal map, but they do have a normal map for high-frequency detail as well. The final touch was the car-keys on top of the receipt. At this point, I had probably sunk 80-100 hours into the modeling, texturing, materialing, and rendering for this scene – so the car keys was the last mesh I made. I was exhausted at this point, but I love the keys – it helps sell the story that this is a random picture someone took before digging in to their delicious burger. Speaking of the burger, I personally love medium-rare cooked burgers. (The only correct option.) OK I also love rare – but sometimes rare is not enough to melt the fat, despite being delicious otherwise. When I planned this render I knew from the outset that this burger wouldn’t be cooked well done (a true tragedy, if not, a crime against humanity.) But my focus on rarity blinded me from reality – as my friends have critiqued, the burger is perhaps TOO rare. I’d still eat it, but really I should render my burgers slightly more medium-rare in the future. I didn’t win the r/blender contest, but I think I should have. Unfortunately there’s a slight bias on the monthly Reddit contest for entries that are submitted earlier on. Because the voting closes at the end of the month, entries submitted earlier have more exposure time to accumulate votes. My main post gathered almost 800 up votes, but my contest entry was too late to gather the mass of votes to compete with the leading first place entry. Winning or losing, it doesn’t matter to me. I had a ton of fun on this project, and it’s one of my most proud works. I certainly learned a ton, got to practice my SSS, while flexing my rendering skill. That’s all that matters – I love my Render.